According to the old country saying, British summertime begins when the elderflower starts frothing in the hedgerows and ends when its dark-black berries appear. 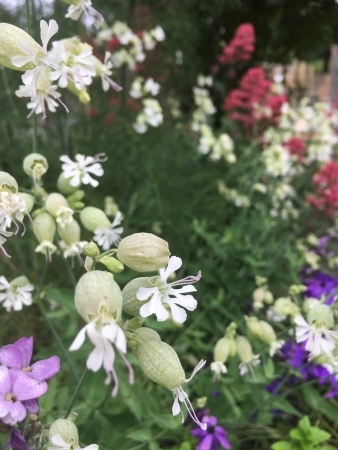 Our client’s gardens around us are all bursting with elderflower and new growth as late spring blossoms into summer, bringing with it a surge of colour. After the elongated winter, we have probably had our busiest spring season ever – hence not having a minute spare to write this column! So, where to start? We have really enjoyed creating a Venetian inspired garden in N6. With a colour plant palette ranging from mulberry to claret and saffrons, and hues in-between, the garden is now full of: Salvias, Astrantias, Acteas, Echinaceas, Heleniums and my fave, Veronicastrum virg. Fascination – to name but a few. We particularly enjoyed recently designing and creating a modern cottage garden look for a young family with a tropical twist! Whilst the garden was planted up with lots of our fave cottage plants ranging from Digitalis purpurea to Lupins and Hollyhocks, with white plants providing the unifying link, it was the addition of structural plants, such as Cardoons and Euphorbias, which helped give the garden a lovely tropical look. One of our favourite plants to create evergreen structure is rosemary, which we added in profusion, along with other edibles. We say out with the herbaceous border, in with the edible border! Embarking upon a one day garden makeover, is always one of our fave jobs! We have been invited into several gardens this season to spend a day cutting back and pruning to let in light. You would be amazed how different a garden can look with a day’s worth of soil improving, re-shaping and a handful of new plants, herbs and edibles. In one garden, twin 7 year old boys were amazed to arrive home from school to find a giant den/tippee built at the end of the garden, created from the green waste we had generated that day! Our community projects are very close to our heart. Probably around 20% of the work we do is free of charge for the community. We are passionate about creating webs of well being around our neighbourhoods. To this end, we created our seventh green intervention in the NW5 area with an Orchard in the football pitch at Acland Burghley secondary school. Yes, you read it right – an orchard in the footie pitch! Bit of a shout out for another of our green interventions – at the back of Ceremony Restaurant in Fortess Rd, we have created a secret allotment. It’s bursting with delish veg and unusual edibles, some of which can be found in the menu. Just mention Transition Kentish Town, an you will get a 20% discount on all cocktails! 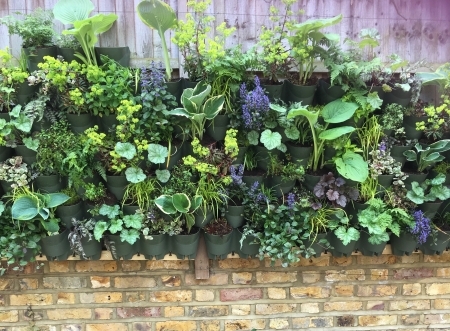 And here’s another call out – you are all invited to our wonderful ‘Listening Space’ garden in the Caversham Group Practice NW5 for a wonderful tea on 23/6, 2-5pm, to celebrate 70 years of the NHS. 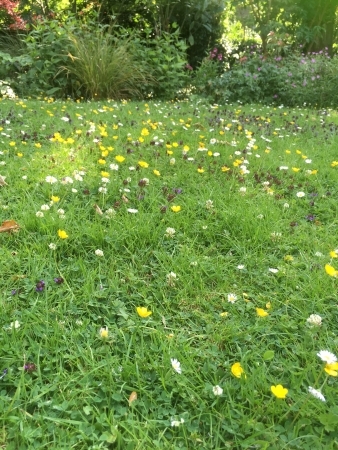 The Listening Space garden is a bucolic garden we planted up with swaying grasses interlaced with lots of lovely colour – a refuge for patients, wildlife and the community, alike. Finally, back to the elderflower. In-between our myriad of jobs, we have had a mo to make some very yummy elderflower cordial. All that’s left is to top it up with a good glug of gin! Whilst our elder trees are in full bloom now, it won’t last long folks..
Green wall being built. We love the palette of strong greens tinged with purple.